It is essential to centralise the design. This is easily done by lightly folding the fabric in half horizontally and vertically, then tacking along the folds. 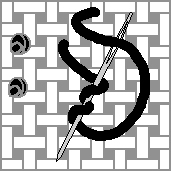 The centre of the fabric is where the two lines meet, and this can then be matched against the centre of the chart which is usually indicated by the arrows. In order to help prevent the stitched material from becoming distorted, a frame or hoop can be used, which will also keep the fabric taut whilst working. If a frame is used, it is a good idea to wrap a strip of material or tissue paper round the hoop to protect the fabric from becoming marked and stretched in the area the frame is placed. When you are not working on the design, always remember to remove the frame. One square on a chart represents one stitch on the fabric. Each thread of stranded cotton consists of six strands. 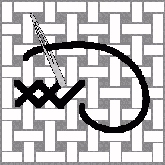 It is usual to cross stitch with two strands of cotton. One length of thread will, therefore, divide into three lengths for stitching. To avoid getting your thread tangled and knotted, use a fairly short length, and try not to carry long threads from one area of stitching to another, particularly in dark colours, since they may show through and ruin the finished work. Always start at the centre, or count out from the centre to the place you wish to start. It is advisable not to secure your thread with a knot when starting, since knots can cause lumps on the right side of your fabric. The easiest method is to draw a thread down from the right side of the fabric, about an inch away from the place you intend to start. Then work towards the loose end of the thread, catching it in as you go. After a few stitches cut the remaining thread off. To finish off, simply thread your needle through some stitches on the reverse of your work and cut off any excess thread. When working cross stitch on the Aida fabric provided in this kit, use every hole. Each stitch is worked over a block consisting of four holes, and it can be worked in two ways. You can either do a line of half crosses first, and then finish the cross by working backwards filling in the opposite diagonal (see diagram 1), or you can work the whole cross in one go (see diagram 2). It is important to work the first diagonal of each stitch in the same direction in order to give a uniform appearance to the finished work. 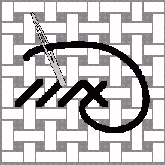 It is best to complete all the cross stitching before outlining the specified areas with backstitch. 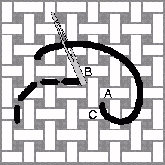 One backstitch should correspond with one cross stitch (see diagram 3). To work backstitch, bring the needle up from the back at A, down from the front at B, and up from the back at C and so on. French knots are worked using two strands of thread as follows. Bring the needle up from the back of your work where you want the knot to be (every alternate hole is a good distance). Hold the thread, and wrap it round the needle twice. Keeping the thread taught, push the needle back through the place where it was initially brought through (see diagram 4).